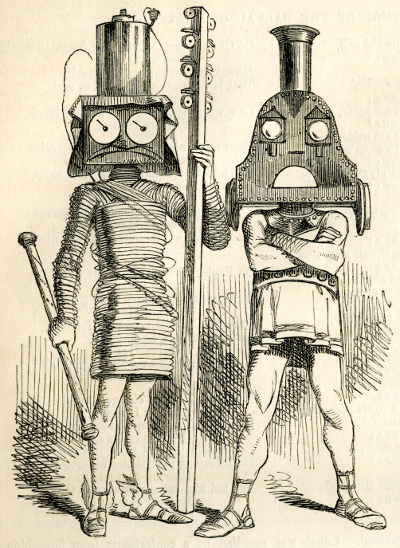 Jocelyn's Cartoons: Visual Linguistics: The Semantics of Line Drawings VIII, "The Two Giants of the Time"
The Semantics of Line Drawings VIII, "The Two Giants of the Time"
Here's a poem from Punch Volume XXXIII, 1857. I'm going to use it as an example of something, but I found it striking and definitely worth a blog entry of its own. It's on the left of page 132, which I've shown below in its entirety, followed by a bigger copy of the picture at the top of the poem and the transcribed text. 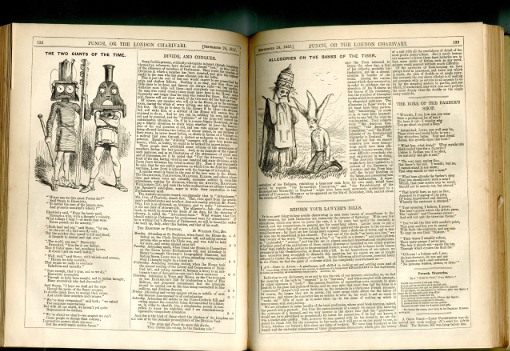 I bought the Punch in an Oxford market: checking online, I see that the Internet Archive has a copy. THE TWO GIANTS OF THE TIME.